The case for a modernized gold standard. Gold, a fundamental, metallic element of the earth’s constitution, exhibits unique properties that enabled it, during two millennia of market testing, to emerge as a universally accepted store of value and medium of exchange, not least because it could sustain purchasing power over the long run against a standard assortment of goods and services. Rarely considered in monetary debates, these natural properties of gold caused it to prevail as a stable monetary standard, the most marketable means by which trading peoples worldwide could make trustworthy direct and indirect exchanges for all other articles of wealth. Gold, by its intrinsic nature, is durable, homogenous, fungible, imperishable, indestructible, and malleable. It has a relatively low melting point, facilitating coined money. It is portable and can be readily transported from place to place. Gold money can be safely stored at very low cost, and then exchanged for monetary certificates, bank deposits, and notes—convertible bills of exchange that efficiently extended the gold standard worldwide. This investment of real labor and capital gives gold an objectively grounded value on which to base proportional exchanges—a value that can be compared to that invested in producing a unit of any product or service. Prices for goods and services always vary with subjective preferences. But the real costs of production persist as an underlying market-price regulator. Despite subjective preferences, a mutual exchange of real money—a gold monetary unit—for a good or service is a transparent, proportional, equitable exchange, grounded by real costs of production, namely labor, capital, and natural resources. In contrast, almost no marginal labor or capital is required to produce an additional unit of paper money. Thus, legal tender paper money is subject only to quantitative control and the discretion of political authorities. Historical evidence shows that inconvertible paper money is overproduced, tending always toward depreciation and inflation, interrupted by bouts of austerity and deflation. Over the long run, government-forced and spurious paper money has not maintained equitable exchanges between labor and capital. Market exchanges based on depreciating paper money and floating paper currencies issued through the banking system always lead to speculative privilege of insiders, generally the financial class. Because of its imperishability and density of value per weight unit, gold can be held and stored (saved) permanently at incidental carrying costs. Precious metal monetary tokens (gold and silver) survived millennia of experiments with inferior alternatives such as shells, grains, cattle, tobacco, base metals, and many others. These alternatives are either consumable, perishable, bulky, or of insufficient value for large-scale commercial exchange over long distances. For example, perishables like wheat or cattle are not storable for long periods at very low cost; nor are they portable cheaply over long distances to exchange for other goods; nor are they useful and efficient to settle short- and long-term debts promptly. Through a process of long-term economic evolution in tribal, interregional, and national trading markets, gold’s natural properties were discovered and utilized in almost all cultures. Gold thus became universally marketable and acceptable as the optimum long-term store of value, uniform standard of commercial measure, and durable medium of exchange. Universal marketability and acceptability is a hallmark of global money. Silver, with its much lower value per unit of weight, was the suboptimal monetary metal of modern civilization, exhibiting many but not all of the properties required for large-scale international exchange. Merchants, bankers, farmers, and laborers may not have consciously considered these facts, but over the long run, they behaved as if they did. Thus gold became an unimpeachable, universally accepted currency, to be held as reserves and passed on as a reliable store of future purchasing power. People, even hostile nations, freely accepted gold, a non-national currency, from one another in exchange for other goods, even as they rejected the sovereign risk of holding national currencies as their exclusive reserves. All who cherished the value of their saved labor—pensioners, working people, those on fixed incomes—came to rely on the gold monetary standard as a stable, long-term proxy for goods and services to be purchased later, perhaps much later. Today’s global stock of aboveground gold in all its forms is approximately 5 to 6 billion ounces, perhaps more—close to one ounce per capita of the world population. Because of gold’s lasting value from time immemorial, and the human incentive to conserve all scarce resources, these 5 to 6 billion ounces represent most of the gold ever produced. Yet the aboveground gold stock today may be enclosed in a cube of approximately 70 feet on each side. Gold may be easily converted to substantial amounts of monetary coin to underwrite convertible paper money and bank deposits for convenient exchange in the market. Moreover, the empirical data demonstrate that the stock of aboveground gold has grown for centuries in direct proportion to the growth of population and output per capita. The average, annual, long-run growth of the stock of gold in the modern world is approximately 1.5 percent. This remarkable fact accounts for the unique, long-run stability of its purchasing power. New output of gold money, joined to its rate of turnover, is sufficient for both economic growth and long-run stability of the general price level, as modest but regular output of gold does not affect the relative value of the large existing stock. This hidden but crucial commercial equation of the social order was a fundamental reason why the true gold standard, i.e., gold-based money, became the foundation of the monetary institutions of modern civilization. Gold-based money not only stabilized the long-term price level, but its network effects also integrated and compounded the rapid growth of the advanced, competitive trading nations of the Western world during the Industrial Revolution. For the purpose of global trade, exchange and investment currencies convertible to the universally acceptable gold monetary standard had engirdled the earth by the beginning of the 20th century. As the technology and productivity of the payments mechanism evolved, banknotes and checking account deposits (among other credit and transfer systems), came into modern circulation as substitutes for physical, monetary tokens. But these banknotes and checks derived and sustained their value from the fact that everyone knew they were credit instruments convertible to gold. Still, actual gold transfers were used to settle residual balance-of-payments deficits among nations, a necessary and efficient international adjustment mechanism by which to rebalance domestic and international trade and exchange. Despite legal tender inconvertible paper money and the disabilities presently imposed on gold by the political authorities, gold retains the same inherent properties that make it the least imperfect monetary standard. Indeed, all inconvertible paper money systems, based on contemporary fractional reserve banking, use the vestigial forms but not the substance of their original convertible currency systems. In sum, gold is natural currency, not least because it provides in a single, indestructible substance the primary functions of money—i.e. a standard unit of account, a stable medium of exchange, a stable store of value, and a stable deferred means of payment. By reason of these facts, the market guided the authorities over time to bestow on gold coin the status of an official monetary standard. Gold money was, moreover, endowed by nature with profound but simple national and international networking effects, the digital standard by which free prices could be communicated worldwide. Thus, the gold standard exhibited natural economies of global information scale, a necessary virtue in the present electronic age. 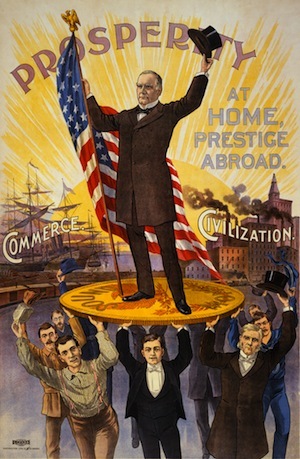 The adoption of the gold standard by the major trading nations in the 19th century led to a radical reduction in the settlement costs of international trade and transactions, a crucial confidence and reliability factor stimulating an unparalleled boom in trade that was constantly and promptly rebalanced by residual deficit settlements in gold. To choose or to reject the true gold standard is to decide between two fundamental options: on the one hand, a free, just, stable, and objective monetary order; and on the other, manipulated, inconvertible paper money, the fundamental cause of a casino culture of speculation and crony capitalism, and the incipient financial anarchy and inequality it engenders. Restoration of a dollar convertible to gold would rebuild a necessary financial incentive for real, long-term, economic growth by encouraging saving, investment, entrepreneurial innovation, and capital allocation in productive facilities. Thus would convertibility lead to rising employment and wages. Economic growth would be underwritten by a stable, long-term price level, reinforced domestically by a rule-based, commercial and central banking system subject to convertibility, and internationally by exchange rates mutually convertible to gold. Consider the past decade of hyper-managed paper currencies and manipulated floating exchange rates wherein American annual economic growth fell to an anemic 1.7 percent. Under the classical gold standard (1879–1914), U.S. economic growth averaged 3 to 4 percent annually, the equal of any period in American history. Different growth rates are not mere accidents of history. The gold dollar, or true gold standard, underwrites, among other things, just and lasting compensation and purchasing power for workers, savers, investors, and entrepreneurs. It prevents massive, recurring distortions in relative prices created by manipulated paper currencies and floating exchange rates, which misallocate scarce resources. It suppresses the incentives for pure financial speculation, everywhere encouraged under manipulated paper currencies and floating exchange rates. It rules out the “exorbitant privilege” and insupportable burden of official reserve currencies, such as the dollar and the euro. It limits and regulates, along with bankruptcy rules, the abuse of fractional reserve banking that is commonplace under inconvertible paper-money systems. It minimizes the enormous premium exacted by the banker and broker establishment in the purchase and sale of volatile foreign exchange. A dollar legally convertible to gold, reinforced by effective bankruptcy law, sustains economic justice, regulating and disciplining speculative capital, and restraining political and banking authorities such that they cannot lawfully depreciate the present value or the long-term purchasing power of lagging dollar wages, savings, pensions, and fixed incomes. Nor under the sustained, legal restraint of convertibility can governments ignite major, long-run, credit and paper money inflations with their subsequent debt deflations. Under the gold standard, the penalty for excessive corporate and banking leverage is insolvency and bankruptcy. As the profits belong to the owners, so should the losses. Bankruptcy of insolvent firms shields the taxpayer from the burden of government bailouts. Under the rule-based gold standard in a free-market order, managers, stockholders, and bondholders must bear the responsibility for insolvency. A stable dollar, convertible to gold, leads to increased saving not only from income, but also from dishoarding, a fact often neglected by economists. Dishoarding means releasing a vast reservoir of savings previously held in hedges such as commodities, antiques, art, jewelry, farmland, or other items purchased to protect against the ravages of inflation. These trillions of savings, imprisoned in hedging vehicles by uncertainty and inflation, are induced out of hedges, and the capital is then supplied in the market to entrepreneurs, business managers, and households who would create new income-generating investment in production facilities, thereby leading to increased employment and productivity. On the other hand, central bank subsidies to government and subsidized consumption, both enabled by inconvertible paper and credit money, lead—through deficit financing, transfer payments, paper money fiscal and monetary stimulation—to disinvestment, debt financing, speculative privilege, and growing inequality of wealth. It is rarely considered by conventional academic opinion that the long-term stability of a rule-based currency convertible to gold brings about a major mutation in human behavior. In a free market every able-bodied person and firm must first make a supply before making a demand. This principle effectively alters human conduct. It encourages production before consumption, balances supply and demand, rules out inflation, maintains balanced international trade, and upholds the framework for economic growth and stable money. In a free market and its banking system, grounded by the rule of convertibility to gold, new money and credit may be prudently issued only against new production or additional supply for the market, thus maintaining equilibrium between total demand and total supply. Inflation is thereby ruled out. Moreover, worldwide hoarding of real assets, caused by government overissue of paper money, would come to an end. The irony of the gold standard and currency convertibility is that it ends speculation in gold. It restores the incentive to use and hold convenient, convertible paper currency and other gold-convertible cash balances. Thus can the road to economic growth, rising real wages, and growing employment be rebuilt on the durable foundation of a free monetary order—that is, money free from government manipulation. The overall balance-of-payments of a country, or a currency area, is in deficit when more money is paid abroad than received; a surplus occurs when more money is received than paid abroad. The United States, because of the dollar’s role as the reserve currency of the world, has experienced an overall balance-of-payments deficit most of the past half-century and, over that full period, systemic inflation. Under both the Bretton Woods agreement (1944–71) and the subsequent floating, dollar-based, global reserve currency system, the U.S. budget and balance-of-payments deficits have been financed substantially by U.S. government trust funds, the Federal Reserve, and foreign purchases of dollars abroad. Since 2008, these deficits have been accompanied by unprecedented quantitative easing, a euphemism for large-scale central bank money and credit creation (or “money printing”). By this means the Fed finances not only the government budget and balance-of-payments deficits, but also overleveraged banks, insolvent debtors, and other wards of the state. The issue of new money by the central bank unaccompanied by the production of new goods and services leads ultimately to inflation because total demand in the market will exceed total supply. With the dollar as the reserve currency, the U.S. balance-of-payments deficit causes Fed-created dollars to rush abroad, directed there by relative price differences. In foreign countries, many of these excess dollars are monetized by foreign authorities and held as official foreign exchange reserves. But these reserves are not inert. They do not lie around in bank vaults. They are in fact reinvested in the U.S. dollar market—especially in U.S. government securities sold to finance the federal budget deficit. In effect, the United States exports its debt securities, thus receiving back the dollars it created and used to settle its balance-of-payments deficits abroad. Everything goes on as if the deficits didn’t exist. No adjustment is required of the United States to settle its debts, or to rebalance the deficits with surpluses. Thus again, total demand is enabled to exceed total supply. In a word, the world dollar standard enables America to buy without really paying, a fundamental cause of inflation. But when the Federal Reserve slows or ends quantitative easing, or money printing, total monetary demand declines and deflation threatens. Rebalancing world trade is impossible under an official reserve currency system. (The International Monetary Fund and the central banks are pathetic shadows of “all the king’s men” trying to put Humpty Dumpty—that is, global rebalancing—back together again.) This perverse international monetary system, whereby the reserve currency country issues its own money to finance and refinance its increasing deficits and debts, augments global purchasing power and potential worldwide inflation, because the newly issued central bank money is not associated with newly produced goods and services. Total demand has been divorced from supply. When total demand exceeds total supply, inflation usually occurs first in marketable, scarce commodities, equities, and inflation hedges (2009–2012); other more general price level effects may be deferred because of unemployed labor and other unutilized resources in excess supply. But ultimately, the general price level will rise as the economy approaches full employment. (The worldwide panic demand for the dollar over the past two years, during the European crisis, has mitigated the general price level effect of quantitative easing. The desire to hold the dollar in cash equivalents rather than to spend or invest it defers inflation.) Under the rule-based gold standard, the regular settlement of balance-of-payments deficits eliminates a root cause of global imbalances, re-establishing equilibrium among trading nations. Under the true gold standard, residual payments deficits could no longer be settled in newly issued national paper and credit monies, such as the reserve currencies of the dollar or euro. Instead, these deficits would be settled with an impartial, non-national monetary standard: gold. The requirement to settle in gold rules out the exponential debt increases of flawed reserve currency systems. A famous example of this is the flawed gold-exchange-reserve currency system of the 1920s, the collapse of which turned a recession into the Great Depression. Another case is the financial bubble and its collapse during the past decade (2002–2012). Moreover, it is very much in the American national interest to terminate the reserve currency role of the dollar. This role is an insupportable burden borne by the United States since the end of World War II (even since the great powers’ Genoa agreement of 1922). The U.S. taxpayer should no longer go further into debt in order to supply the world with dollar reserves denominated in U.S. debt. Terminating this burdensome “privilege,” combined with the restoration of dollar convertibility to gold, will gradually end the long era of extreme global trade imbalances, secular debt accumulation and inflation, and currency depreciation. Furthermore, because the reserves of monetary authorities will be held only in gold and domestic currency claims, the exchange-rate risk will be eliminated in all national banking systems. The rule-based, true gold standard not only would end the official reserve currency role of the dollar, but also limit arbitrary Federal Reserve money issuance secured by spurious, defective, and illiquid collateral. Unstable mutations in the gold standard of the past—including the failed reserve currency–based “gold-exchange” system of Bretton Woods and the collapse of its predecessor, the reserve currency–based “gold-exchange system” of the 1920s and 1930s—must be ruled out. So, too, must floating exchange rates. For almost a century, policymakers, politicians, historians, and economists have confused the flawed, interwar gold-exchange standard, based on official reserve currencies, with the true or classical gold standard. They have mistakenly blamed the Great Depression on the gold standard, instead of on the liquidation of the official reserve currencies underpinning the gold-exchange system established at Genoa in 1922, which, like Banquo’s ghost, reappeared in 1944 in the form of the Bretton Woods system. The Bretton Woods pegged exchange rate system, based on the official reserve currency role of the dollar, collapsed in 1971 because the United States had accumulated more short-term debt to foreigners than it was willing to redeem in gold. Its collapse ushered in the worst American economic decade since the 1930s. The unemployment rate in 1982 was higher even than the unemployment rate occasioned by the collapse of the Fed-induced real estate bubble of 2007–09. Similarly, the recession of 1929–30 became the Great Depression of the 1930s because of the collapse and liquidation of the interwar official reserve currency system, based as it was on the pound and the dollar. The liquidation of official sterling and dollar currency reserves deflated the world banking system: Without these foreign currency reserves the banks were forced to deleverage, call in loans, or go bankrupt. They did all three. Since 1971, the floating exchange rate system, or the world dollar standard, has been even more perverse and crisis-prone than Bretton Woods and the Genoa interwar system. The dollar’s role as the reserve currency has caused not only extreme inflation and the subsequent threat of deflation, but also industrial and manufacturing displacement in the United States. It has resulted in declining American competitiveness, one witness of which is the collapse of the international net investment position of the United States (essentially, U.S. assets held abroad, less foreign assets held in the United States). In 1980, the U.S. net international investment position was 10 percent of GDP. In 2010 it was negative 20 percent of GDP. The difference was equal to the increase of foreign-held official dollar reserves, arising from continuous U.S. balance-of-payments deficits under the dollar-based official reserve currency system. Under the present system, the perennial U.S. balance-of-payments deficit will, more often than not, continue to flood foreign financial systems and central banks with undesired dollars, followed by brief periods of dollar scarcity, the threat of deflation, and a cyclical rise of the dollar on foreign exchanges. Foreign authorities may continue to purchase excess dollars against the issue of new domestic money. This duplicates potential purchasing power unassociated with the production of new goods, causing total demand to exceed total supply—thus tending to sustain worldwide inflation, generally followed by recession and the threat of deflation. So-called sterilization techniques designed to neutralize central-bank money printing are not fully effective. Without monetary reform, the excess dollars purchased by foreign central banks, reinvested in U.S. government securities and other dollar debt, will continue to finance excess consumption and rising government spending in the United States. Today inflation of the general price level (or CPI) proceeds gradually in the United States because of unemployed resources, combined with the panic demand worldwide to hold the dollar rather than spend it, or to repay debt with the money rather than to consume. At full employment, inflation will pick up. Because the reserve currency system generally leads to a rapid increase in global purchasing power, without a commensurate increase in the supply of goods and services, the systemic tendency of the reserve currency system is monetary expansion or inflation. Yet the process can work dangerously in reverse, causing deflation, especially when the Fed tightens, or there is panic out of foreign currencies into the dollar (the Asian crisis, 1996–2002, and the euro crisis, 2012). Illiquidity abroad can cause foreign official dollar reserves to be resold or liquidated in very large quantities, reducing the global monetary base, as occurred in 1929–33 and recently in 2007–09. In the absence of government rules that favor inconvertible paper and credit money, the historical evidence shows that gold, or paper and credit money convertible to gold, was preferred and accepted in trade and exchange from time immemorial. Until recent times the gold standard also underwrote, indeed required, global trade rebalancing, now the subject of empty exhortations by the International Monetary Fund and political authorities. But to desire a goal without the effective means to attain it—namely, the true gold standard—is to court political and financial disaster. In the absence of prompt balance-of-payments settlements in gold, the undisciplined official reserve currency systems have immobilized the international adjustment mechanism. The result has been increasing trade imbalances, ever-rising debt, and credit leverage at home and abroad. Under the world dollar standard, other nations have gained desired dollar reserves only as the United States becomes an increasingly leveraged debtor through balance-of-payments deficits. Whereas under the gold standard, the global economy may actually attain balance-of-payments surplus as a whole vis-à-vis worldwide gold producers. Among its monetary virtues as the least imperfect monetary system of civilization, the true gold standard, without official reserve currencies, is the sole rule-based monetary order that reliably and systematically rebalances worldwide trade and exchange among all participating nations. Step 1. The president announces unilateral resumption of the gold monetary standard on a date certain, not more than four years in the future. Unilateral resumption means that the U.S. dollar will be defined by law as a certain weight unit of gold. The Treasury, the Federal Reserve, and the entire banking system will be obligated to maintain the gold value of the dollar. On the date of resumption, Federal Reserve banknotes and U.S. dollar bank demand deposits will be redeemable in gold on demand at the statutory gold parity. Further use by foreign governments of the dollar as an official reserve currency will entail no legal recognition by the United States. Step 2. The president issues an executive order eliminating all taxes imposed on the buying, selling, and circulating of gold. Another executive order provides for the issuance of Treasury bonds backed by a proportional weight of gold. Since Federal Reserve notes and bank deposits (money) are not taxed by any jurisdiction, the executive order specifies that gold, being legal tender, is to be used as money and thus to go untaxed. Gold can be used to settle all debts, public and private. The Treasury and authorized private mints will provide for the creation and wide circulation of legal tender gold coin in appropriate denominations, free of any and all taxation. Step 3. Shortly after announcing the intent to go forward to a modernized gold standard, the United States calls for an international monetary conference of interested nations to provide for the deliberate wind-up of the dollar-based, official reserve currency system and the consolidation and refunding of foreign official dollar reserves. The international agreement to be negotiated will inaugurate the reformed international monetary system of multilateral convertibility of major countries’ currencies to the gold monetary standard. Stable exchange rates would be the result. The value of each participating currency would be a function of its stipulated gold parity. Step 4. The conference, attended by representatives of the Bank for International Settlements, International Monetary Fund, World Trade Organization, and the World Bank, would establish gold as the means by which nations would settle residual balance-of-payments deficits. The agreement would designate gold, in place of reserve currencies, as the recognized international monetary reserve asset. Official foreign currency reserves, to a specified extent, would be consolidated and refunded. Step 5. A multilateral, international gold standard—the result of the conference convertibility agreement—would effectively terminate floating and pegged-undervalued exchange rates. The reformed monetary system without official reserve currencies, the true international gold standard, would establish and uphold stable exchange rates and free and fair trade, based upon the mutual convertibility to gold of major national currencies. Now we are able to formulate an authentic, bipartisan program to restore 4 percent American economic growth over the long term. Tax rate reductions with an enlarged tax base, government spending restraint aimed at a balanced budget, simplification of business regulation designed to empower entrepreneurial innovation—these reforms can be made effective for America and the world by a modernized gold standard and stable exchange rates. This is the very same platform which uplifted 13 impoverished colonies by the sea in 1789 to leadership of the world in little more than a century.